WHITTIER – Santa Fe High School senior Maximas Gomez is an exemplary student whose profound drive for success has propelled him to shine as a role model to his peers and teachers alike. After working summer jobs with his father starting at age 5, Gomez has learned the value of time, the cost of necessities and the tireless amount of work it would take to get ahead in school and in life. Those experiences and efforts have resulted in Gomez’s continued success at Santa Fe. He was recently honored by the Whittier Union High School District Board of Trustees with the Award of Merit. “I want to thank my family, friends and the administration at Santa Fe not only for allowing me to immerse myself in the culture of Santa Fe as deeply as I am, but to develop the culture at Santa Fe and my character throughout my years,” Gomez said. Gomez spent his K-5 years at Lakeland Elementary and his middle school years at Lake Center Middle School before moving on to Santa Fe High School, where he has completed 28 semesters of Honors/Advanced Placement coursework and is in the top 3 percent of the senior class. He plays many leadership roles on campus and in the community. He is president of the Associated Student Body, which he has been a member of for three years, is the Santa Fe representative on the Superintendent’s Student Advisory Council, and has demonstrated his athletic abilities in cross country, track and wrestling. Outside of school, he spends many hours volunteering for the City of Santa Fe Springs Library and stays active through local running organization, Run Delay. Gomez, who maintains a weighted 4.38 GPA, has applied to several universities, including Whittier College, Brown, Princeton and Columbia and plans to study English and economics. 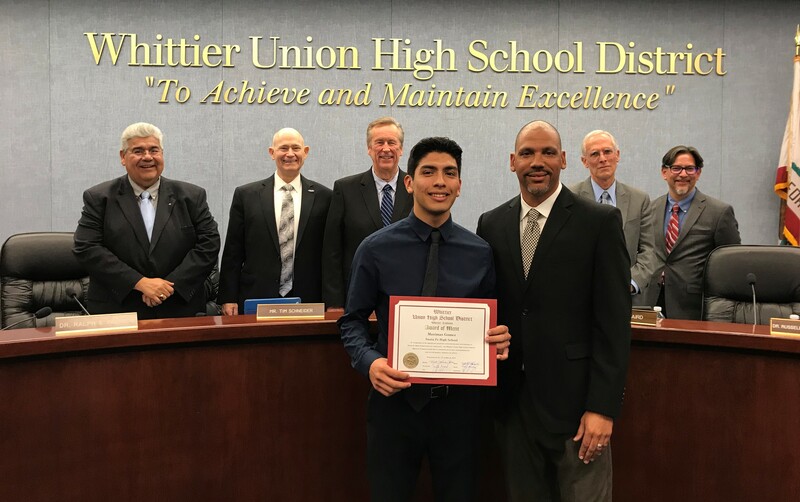 040819_WUHSD_MAXGOMEZ: Santa Fe High School senior Maximas Gomez was honored with an Award of Merit by the Whittier Union Board of Trustees on March 12. Pictured are Gomez with Principal Craig Campbell, along with Board of Trustees Member Dr. Ralph Pacheco, left, Member Tim Schneider, Clerk Leighton Anderson, Vice President Jeff Baird and President Dr. Russell Castañeda-Calleros.